Spring has definitely sprung over here with a high of 72 yesterday (followed by a couple inches of snow this morning), and the warm weather has gotten me thinking about the berry pies and lemony goodness that become more popular in the coming season. 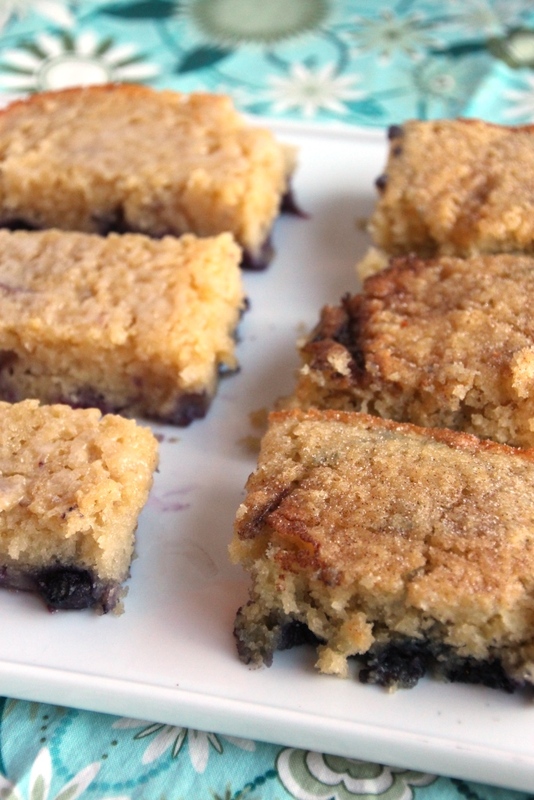 I decided something blueberry was definitely in order and perused my bookmarks and Pinterest boards in hopes of seeing something that piqued my interest. It didn’t work (ha) but I did ultimately remember a fabulous blueberry dish I made at home several years ago called Blueberry Boy Bait. The name has always made me giggle and the dish is amazing. A quick Google search brought me right to the lovely post from Smitten Kitchen I so fondly recalled. Before we get much further, please bear in mind there is absolutely nothing healthy about this. It’s cake. I know there’s no frosting, but it’s like 90% butter (slight exaggeration) and 100% delicious and you should definitely make some. Just know that this is not a health food, and if you’re looking for one of those you should bake some Blueberry Oatmeal Muffins instead. Still here? Excellent. 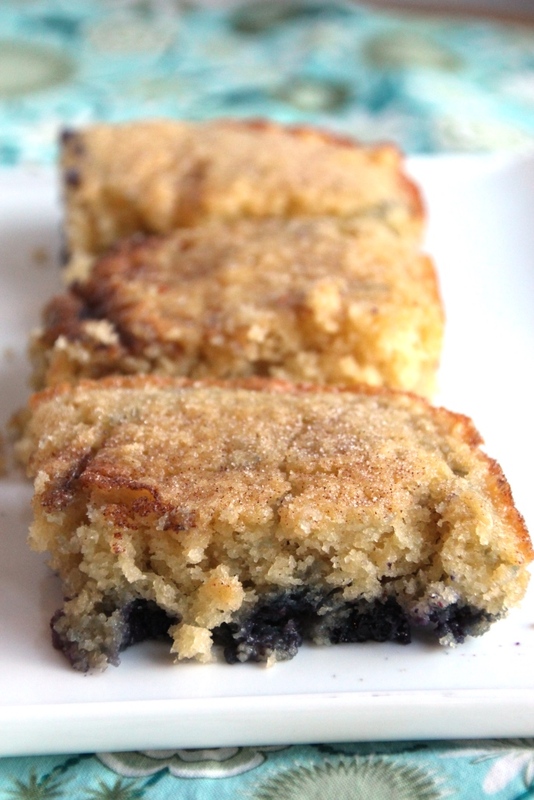 Rich and buttery, fluffy and moist, brimming with blueberries, and topped with a cinnamon & sugar coating I always adore, it’s hard to have just one piece. After making it again, I’m honestly not sure why I waited so long and it will definitely be put in a more regular baking rotation. It pairs equally well with a cup of coffee for breakfast or snack, and a glass of milk for dessert. Or a handful straight from the cooling rack to your mouth because you “accidentally” didn’t grease the pan well enough and had to hide the evidence. 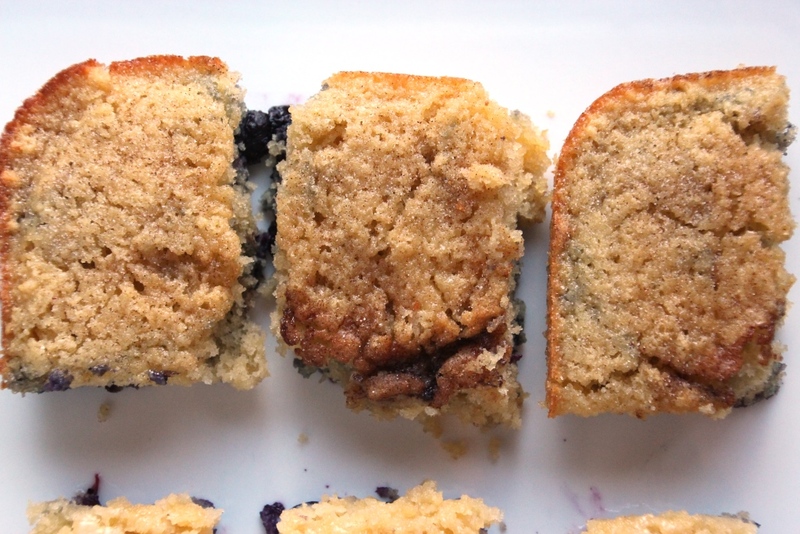 The blueberries do always sink to the bottom for me, but I consider this a feature rather than a problem, as it results in a perfectly proportioned cake-to-blueberry ratio with every bite. The cake is somewhat fragile, so be careful removing it from the pan. If you’re concerned about presentation, you could bake them in a muffin tin with paper liners instead, but I have not personally tried this. Since spring was in the air, I tried a lemony version as well. I definitely prefer the original, but this is a nice alternative if you’re in the mood for it. Preheat oven to 350 degrees Fahrenheit. Grease an 8×8″ baking dish and line the bottom with parchment paper. Grease the paper too. Add butter and sugars to the bowl of an electric mixer and beat for about two minutes on medium-high speed until light and fluffy. Meanwhile, whisk together flour, baking powder, and salt in a small bowl. Set aside. Add eggs to butter mixture one at a time, mixing until just incorporated and scraping the bowl between each one. Alternate adding flour (1/3 at a time) and milk, starting and ending with flour. 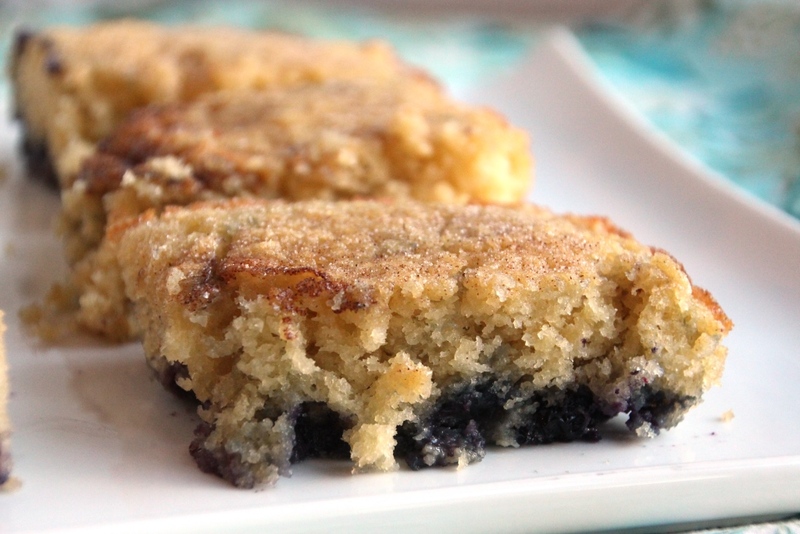 Spread into prepared pan and sprinkle additional 1/4 cup blueberries onto the batter. Mix together sugar and cinnamon and sprinkle about half over the top. Bake about 35 minutes or until a toothpick comes out clean and the top doesn’t look super wet. Immediately sprinkle with additional cinnamon & sugar topping (optional but recommended). Cool at least 20 minutes in the pan before serving. 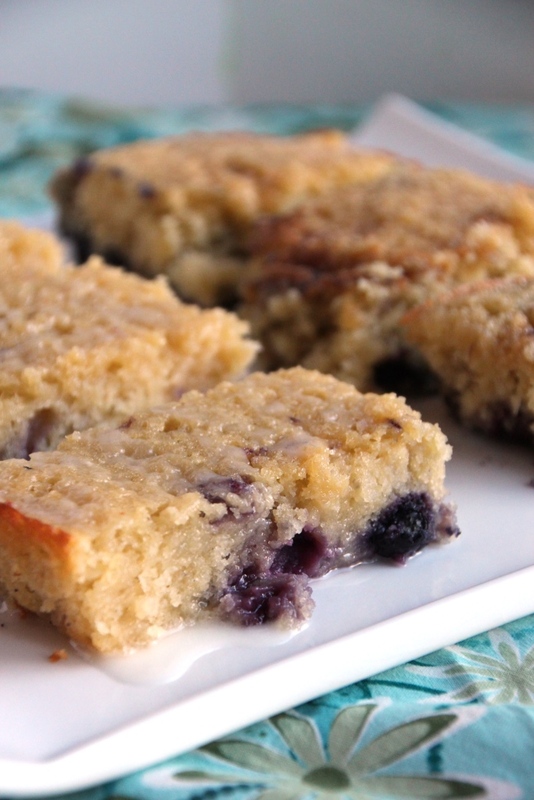 Attempt to not eat the entire pan in one sitting, but fail deliciously. 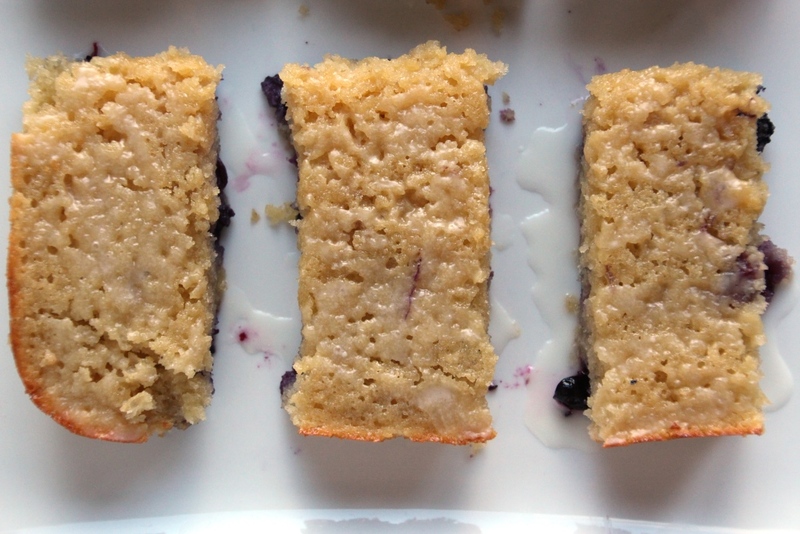 Make as above except substitute 3 tablespoons of milk with lemon juice. Omit cinnamon sugar topping. Whisk 3/4 cup powdered sugar with 1-2 tablespoons lemon juice and use to lightly glaze cooled cake.